Second GovCloud Region in the United States Is Live: The AWS GovCloud (US-East) Region, our second GovCloud infrastructure region in the United States is now live with the recent launch of the AWS GovCloud (US-East) Region. The AWS GovCloud Regions meet the stringent requirements of the public sector and highly regulated industries, including being operated on US soil by US citizens, and is accessible only to vetted US entities and root account holders who must confirm they are US persons. AWS customers can now enjoy the second AWS GovCloud Region in the eastern part of the United States for reduced latency, added redundancy, data durability, resiliency, greater disaster recovery capability, and the ability to scale across multiple regions. This year also brought in the most GovCloud launches since its inception. Read the blog post. Speed Time to ATO with ATO on AWS: We announced the Authority to Operate (ATO) on AWS program, which provides resources to Independent Software Vendors (ISVs) who aspire to achieve compliance. To speed time to authorization, we launched ATO on AWS. ATO on AWS includes training, tools, templates, and pre-built artifacts. Additionally, customers are able to access direct engagement and guidance from AWS compliance specialists and support from expert AWS consulting and technology partners who are a part of our Security Automation and Orchestration (SAO) initiative. Read the blog post. FBI Analyzes Data in the Cloud to Deliver on its Mission: The FBI is using AWS to gather and analyze intelligence for mission workloads for their project, Sandcastle. When dealing with massive amounts of data, speed is critical. Analysts need to be able to parse, package, and derive conclusions as quickly as possible. The AWS Cloud helps the FBI search across multiple databases simultaneously, analyze this data, and provide information in a useable format that allows agents to act and deliver on their missions at a pace previously not possible. NASA Landed on Mars: NASA JPL landed a new rover (InSight) on Mars and the landing was live-streamed on Monday at re:Invent. 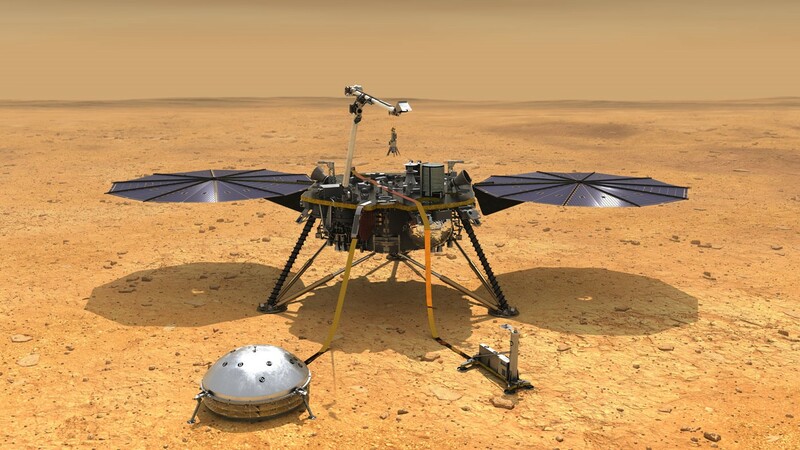 InSight, short for Interior Exploration using Seismic Investigations, Geodesy and Heat Transport, is a Mars lander designed to give the Red Planet its first thorough checkup since it formed 4.5 billion years ago. This exciting project will provide NASA with a whole new understanding of Earth’s nearest neighbor. UK Home Office Achieves 40% Cost Saving Using the AWS Cloud: The UK Home Office uses the AWS Cloud to enable internal stakeholders to deliver services at a faster pace. Jackie Keane, Director of Immigration Technology, discussed how their use of cloud services has streamlined their operations and, ultimately, provided better services to those involved in immigration activities. From reduced cycle times to more frequent releases to saving taxpayer money, Home Office is delivering on a new level and reducing costs by 40%. The organization has experienced a culture shift and now the old and new are working in harmony, resulting in high-performing teams. Other business units throughout Home Office are beginning to adopt and re-use AWS best practices to optimize within their own departments. Open Data is Key to Understanding Earth and the Galaxy Beyond: At AWS, we launched the AWS Registry of Open Data (RODA) to serve as a home base for datasets available through AWS resources. These datasets provide insights into a wide range of fields and topics from life sciences and machine learning to the environment and cyber security. In October, we announced the availability of 19 new datasets to the registry. Sharing datasets is just the first step in making data truly open to all. We’ve partnered with the Group on Earth Observations to make data both open and accessible to developing countries around the world. Over the next three years, AWS will issue up to $60,000 in AWS Promotional Credits to as many as 25 potential customers around the world. Expanded AWS Educate Offerings: We are also deepening our efforts to foster a passion for cloud among students ages 14 and up. Listening to our users, we have updated the AWS Educate user interface for a more engaging experience. For students ages 14-17, we now offer three badges for students to pursue: Cloud Explorer, Cloud Inventor, and Cloud Builder. Both our Cloud Explorer and Cloud Inventor badges have been revamped with a more game-based experience. And the new Cloud Builder badge gives students hands-on experience building a website and chatbot. Additionally, there are supplemental teacher materials available mapped to the core computer science principles, so both student and teacher feel empowered to explore, invent, and build. We also launched a new Deep Lens badge to teach Educate students how to leverage this powerful deep learning tool. And perhaps most importantly – all AWS Educate pathways will soon be available in seven new languages, including Simplified and Traditional Chinese, French, German, Italian, Spanish, and Portuguese. Connecting Students with Jobs: AWS Educate is releasing significant enhancements to its job board and career-management tools for members to create a pipeline of cloud-ready students for companies that use AWS. The program, available at no cost to students and educators around the world, is also launching the AWS Educate Interview Accelerator in the U.S., putting qualified students in the fast lane to job opportunities. Watch for its launch in additional countries in the future. Read the blog post. Expanding Cloud Associates Degrees: This summer, Northern Virginia Community College (NOVA) and AWS launched the world’s first Cloud Associate Degree supported by AWS curriculum. NOVA will be an anchor for a state-wide program that will expand to include four-year degrees at other Virginia schools. Today, we are taking the first step to replicating this model in Florida and Ohio. Next year, Miami Dade College (Florida) and Columbus State Community College (OH) will launch their own Cloud Associate Degree. We’ll continue to work to expand this model worldwide. Voice Technology on Campus: The student experience at universities continues to be transformed through voice technologies. There are now almost 50 schools that have leveraged Alexa for Education, including Saint Louis University, which provided an Alexa to every incoming freshman this fall. We continue to roll out new skills (nearly 50 so far) for Alexa for Education. To make adoption even easier, we are now thrilled to provide a bundle containing an Alexa Device, Alexa for Business, and services. Quickly and Easily Build Intelligent Robotics Applications: We announced the availability of AWS RoboMaker, a new service that makes it easy for developers to develop, test, and deploy robotics applications, as well as build intelligent robotics functions using cloud services. AWS RoboMaker extends the most widely used open source robotics software framework, Robot Operating System (ROS), with connectivity to AWS services including machine learning, monitoring, and analytics services to enable a robot to stream data, navigate, communicate, comprehend, and learn. AWS RoboMaker provides an AWS Cloud9-based robotics integrated development environment for application development, robotics simulation to accelerate application testing, and fleet management for remote application deployment, update, and management. This is exciting for universities, where a lot of robotics research is happening. We are already piloting AWS RoboMaker with 12 universities. Introducing the Smart City Cloud Innovation Center at ASU: Arizona State University (ASU) announced the ASU Smart City Cloud Innovation Center (CIC) powered by AWS, an initiative that focuses on building smarter communities in the Phoenix metropolitan area by using the AWS Cloud to solve pressing community and regional challenges. The ASU campus-based center will address regional challenges using the AWS Cloud, with a specific focus on artificial intelligence and machine learning. The new center is designed as part of a long-term collaboration between ASU and AWS to improve digital experiences for smart city designers, expand technology alternatives while minimizing costs, spur economic and workforce development, and facilitate sharing public sector solutions within the region. The introduction of the CIC is yet another indication of ASU’s commitment to bringing cutting-edge technology and innovation to those on campus and in the greater Phoenix community. In August 2017, ASU placed 1,600 Amazon Echo Dots in its Tooker House engineering residential facility, giving students access to a custom ASU-developed skill for Amazon Alexa. For the Fall 2018 semester, ASU collaborated with AWS Educate to launch its Innovation Scholar Challenge, which included a series of cloud skill-building workshops and on-campus hackathons. Read the blog post. Building a Stronger Industry with We Power Tech: Underlying all of our efforts is a commitment to building a diverse and inclusive tech workforce. The centerpiece of our diversity efforts, We Power Tech, continues to engage underrepresented communities around the world. On November 7, we held the We Power Tech “Day in the Cloud” training for women in Bahrain. Forty-seven women from across the country attended a full day of AWS Tech Essentials taught by the AWS training team. And today we welcomed 30 young women from around the world to re:Invent. Trend Micro has sponsored these women to attend re:Invent as part of the company’s “Close the Gap” program. This is just one of the many important efforts happening among AWS partners. We would like you to help us build a scalable approach our collective efforts. Send us an email at ClosetheGap-Dinner@amazon.com to get involved. Tech Does Good on Giving Tuesday: Giving Tuesday is a worldwide celebration dedicated to supporting nonprofits around the world. In 2017, people like you donated more than $247 million to your favorite organizations. We’re humbled that many of the donor platforms that make Giving Tuesday possible run on AWS, both to achieve their missions and to scale for fundraising events like this. More than that, we’re excited to participate! Read the Amazon Guide to Giving Tuesday. Investing for Good with ICMEC: By moving to the AWS Cloud, the International Centre for Missing & Exploited Children (ICMEC) reduced the costs of maintenance and pushed its IT teams to be more creative to further their mission. ICMEC’s mission is to eradicate child abduction, sexual abuse, and exploitation. ICMEC created the GMCNgine, a centralized platform that uses artificial intelligence, machine learning, and Amazon Rekognition to scour the internet for photos of children to compare against images from ongoing cases of missing children from across the globe. The results provide law enforcement and NGOs with leads on the possible whereabouts of missing children. Watch the video and find ways you can get engaged. Fostering Nonprofit Expertise with AWS Imagine Grants: We also continue to work closely with nonprofits to build their technical capabilities. This August, we launched the Imagine Grant program –our first-ever monetary grant program for nonprofits. Applicants wrote an Amazon six-pager to explain how an Imagine Grant could help their organizations leverage technology to better achieve their mission. Congrats to the winners – Re-plate, Path, CommunityConnect Labs, Ushahidi, tarjimly, and Urban Institute. Helping to End Future Famines with Machine Learning: The United Nations, World Bank, and International Committee of the Red Cross (ICRC), with support from Amazon Web Services and other technology companies, recently launched the Famine Action Mechanism (FAM). The FAM is the first global mechanism dedicated to preventing future famines. In the past, responses to these devastating events have often come too late, once many lives have already been lost. To create a model that takes into account the multidimensional causes of famine, AWS is using a diverse dataset processed by the World Bank team together with UN partners that includes features from satellite imagery, conflict data, weather forecasts, local food prices, and agricultural production and is able to train multiple machine learning models. The models have so far been able to identify significant and distinctive patterns across geographical regions and countries. Listen to the podcast. Expansion of the AWS Public Sector Partner Program: We continue to expand the AWS Public Sector Partner Program. The APN grew nearly 40% in 2018 and more than 800 APN Partners are now part of the program serving government, education, or nonprofit customers around the world. Watch the full video of the breakfast here.